Finally, IT staff receives thorough training in order to be able to apply the new processes in practice, and clients or users might need to be informed - in so far as these are affected by the new ITIL processes. First of all process participants must be made familiar with the new processes. This implementation guide made sure at various points that those participants are involved in the process design early on, so in most cases there should be no need to explain how processes will change. Background knowledge on ITIL is decisive for the success of the new processes and should be made available to all parties involved; basic ITIL training may take place at the beginning of the project for important key players, so that they are able to convey the ITIL principles to the other project participants. Ultimately the clients are also to be informed, for example if a new Service Desk has been established and as a result the procedure for placing Service Requests has changed. Communicate process changes early and to all parties involved. If the process participants learn of the new processes only at this stage, a lack of acceptance will be inevitable. As many employees as possible should therefore be involved in the design of the processes during the earlier project phases. As already stated, all parties concerned should be invited to co-operate and introduce their experiences throughout the project course. The process overviews of the ITIL Process Map are very helpful in the explanation of the new ITIL processes and the illustration of their interdependencies (see Figure 1). 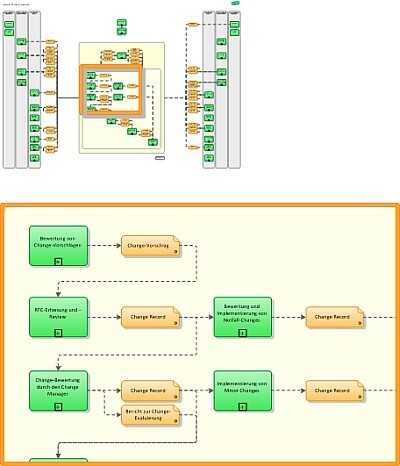 For detailed information about processes, the detailed process flows and ITIL templates are useful resources. 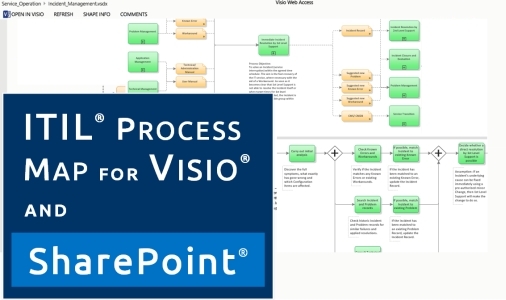 In this video we demonstrate how you can use the ITIL process model for Visio in combination with SharePoint® for publishing your ITIL processes.